For every item you purchase you can receive one free $1 item of your choice. Simply LEAVE FEEDBACK for the item you purchased and email me a link for the item you’d like free! This is basically a buy one, get one free promotion, you just need to leave feedback before receiving your free $1 item. Please send email requests to: GingersDollarTechStop@gmail.com. Thanks and don’t forget to follow me for special inbox promotions and new items! Don't want to worry about finding the letters you need for your bulletin board? Don't like the hassle of buying more than one set of letters only to use a few? Here is a perfect saying for your April or Spring bulletin board complete. 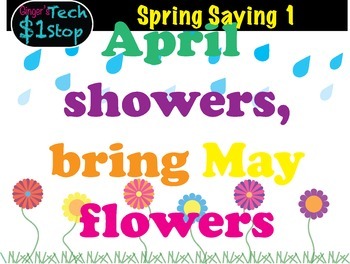 Included is one product page--a png and jpg image of the entire saying and clipart images, an image of each clipart flower, grass, and raindrop (individual and grouped raindrops), and individual letters for each letter in the saying. The only letters included in this product are those in the saying. All of my images are in 300dpi png format, which will allow for crisp and clear printing or layering. This clipart can be used both digitally or for printed use.